Note: this site is still under construction. Description: this is an online catalogue and website for the Robert Addison Library, one of the oldest private libraries in Canada. This project has involved a re-cataloguing of the library, photographing of the title pages, development of a database and online catalogue. I have been responsible for all digital aspects of this project. Description: this blog documents the development of the Robert Addison Library project. Documentation: click an item below to download a report or visit the blog. Note: this was a group effort involving myself and two colleagues. Description: This project involved designing a mobile interface for a site of our choosing or creation. 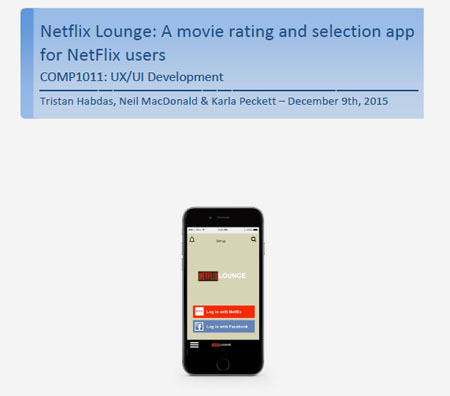 We chose to create a new mobile interface for Netflix. Responsibilities: group members provided input at every stage; however, I was solely responsible for writing and editing the final report. Description:A fan page intended to demonstrate CSS3 and responsive design techniques. Check out the site to see how it appears at different sizes. Note: This assignment is not available for download as the instructor still uses it. 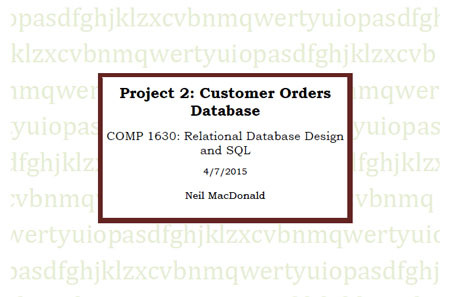 Description: This project involved designing and building a customer orders database that would work with an existing dataset and could perform assigned functions. Note: For this project, I created an imaginary company (MacDonald Designs) to tackle a real project. Description: This project involved designing a project and preparing the project charter. Note: this department and site are no longer active. 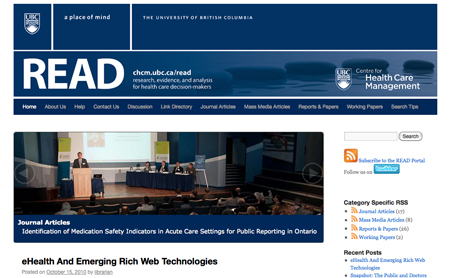 Description: the READ (Research, Evidence, and Analysis for health care Decision-makers) Portal is an online resource which provides health care decision-makers with the latest grey literature, journal articles, mass media articles, and working papers on the topic of health care management in Canada and abroad. Note: due to privacy considerations, this wiki is restricted to Biomedical (BMB) Library staff members. Description: This wiki allows staff members to record their shift notes in a central repository, enabling staff to read, comment on, and learn from each other’s experiences within the library. The wiki also has sections for staff contact information, monthly schedules, archives of shift notes and schedules from previous months and years, and a documentation section with detailed instructions for maintaining the wiki. Note: this is a student indexing project. Description: "The Carnegie Libraries of Scotland Index" is a back-of-book style index of "The Carnegie Libraries of Scotland" website. I designed the index page in a style that is consistent with the original website. The index has a headnote with a link to a style sheet which I created and used for this project. 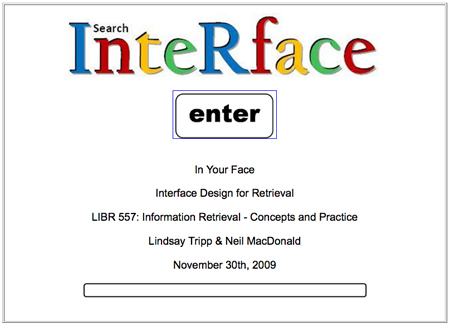 All entries in the index are hyperlinked to the relevant pages. Note: this project is the result of a group effort (four students). Description: the purpose of this assignment was to select or invent a user group that would require the creation of a thesaurus, develop a short thesaurus and present it in the form of a website. Responsibilities: while each individual had an area which they were responsible for completing, group members provided input at every stage. Note: this project was a collaboration with one colleague. Description: This project was completed in two parts by myself and my colleague Lindsay Tripp. The first part is a PowerPoint Presentation which accompanied an hour long class presentation. The second part is an HTML-based essay. Description: We used a combination of traditional and non-traditional review tools to describe an ideal cyberpunk (a sub-genre of science fiction) collection for a public library with a focus on providing popular reading material, including: fiction, videos, graphic novels, serials, and reference material. 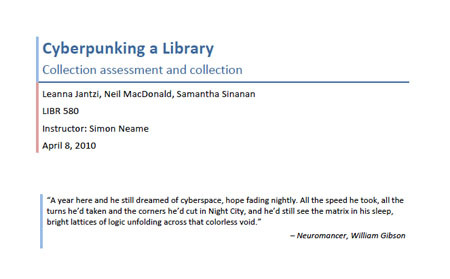 With this ideal collection in mind, we then assessed the North Vancouver City Library's cyberpunk collection and made recommendations to enhance the library's existing collection. This site was designed and is maintained by Neil MacDonald, © 2017.